The US Government shut down at the beginning of October while political parties argue over policy leaving many government employees wondering when their next regular paycheck will come, but to best of our knowledge, the shutdown has not affected the half dozen or more ghosts reportedly haunting the White House halls. The home of the US president is known for its historical hauntings as much as it is known for being the place where political decisions are made. At least a dozen people have died in the White House since its completion around 1800, including two presidents and several presidential family members. 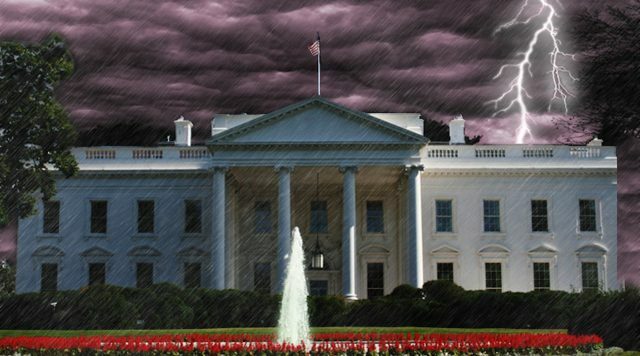 Several of those who died at 1600 Pennsylvania Avenue are allegedly haunting it to this day, as are several others with White House connections including David Burnes, the man whose property was taken in 1790 so it could be built. *Elisha Hunt Allen (d. Jan. 1, 1883) – The Kingdom of Hawaii’s Minister to the United States died while attending a dinner for diplomats hosted by President Chester Arthur. He was 79 years old. *Fredrick Dent (d. Dec. 15, 1873) – The father-in-law of President Ulysses S. Grant, who also had a history of military service, Dent’s funeral was held in the White House Blue Room. He was 86. *Caroline Scott Harrison (d. Oct. 25, 1892) – She was the wife of President Benjamin Harrison, and died in the White House of tuberculosis at the age of 60. Her funeral was held in the East Room. *William Henry Harrison (d. April 4, 1841) – Harrison was elected president and took the oath of office March 4, 1841. He died 32 days later of pneumonia, allegedly due to his inaugural celebrations in the rain and cold. He was the grandfather of President Benjamin Harrison. He is one of only two presidents to die inside the White House. He was 68. *William Wallace Lincoln (d. Feb. 20, 1862) – President Abraham Lincoln’s son, only 11 at the time of his death, is believed to have succumb to typhoid. Funeral services were held in the Green Room of the White House. *Rev. John Witherspoon Scott (d. Nov. 29, 1892) – Father of First Lady Caroline Scott Harrison, he lived with the Harrisons throughout Benjamin’s term of office. The 92-year-old died in the White House one month after his daughter. *Zachary Taylor (d. July 9, 1850) – The second president to die in the White House, Taylor became ill at a Fourth of July celebration and died just days later. It is believed severe gastroenteritis was to blame. Taylor was 65. *Letitia Christian Tyler (d. Sept. 10, 1842) – First Lady to John Tyler, she was known to be reclusive due to illness, and eventually died of a stroke at the age of 51. She was the first of three presidential wives to die in the White House. *Rebecca Van Buren (d. 1840) – The daughter of Abraham and Angelica Van Buren, Abraham being the son of President Martin Van Buren, she died in the fall of 1840, just a few months after her birth. She is believed to be the first person to die in the White House. *Margaret Elizabeth “Madge” Gates Wallace (Dec. 5, 1952) – Mother-in-law to President Harry S. Truman, Wallace died in the White House at the age of 90. *Ellen Louise Wilson (d. Aug. 6, 1914) – The wife of President Woodrow Wilson, Ellen died in the White House due to complications of Bright’s Disease. She was 54. It seems that brushes with the paranormal and the world of the weird can happen to anyone at anytime. People of all ages and from all walks of life have had experiences with things that lie beyond their understanding, leaving them baffled and in wonder of what lies beyond the veil of what we think we know. Certainly some odd accounts have come even from our leaders and people in great power, and U.S. presidents over the ages have not been immune to strange encounters and tales of the paranormal. Here are a few of the more bizarre stories of American presidents and their experiences with that strange world beyond our comprehension. One very well-known strange story concerning an American president lies within the world of cryptozoology and revolves around none other than the 26th president and consummate outdoorsman and naturalist Theodore Roosevelt Jr. Known for forging himself into a tough as nails, swaggering man’s man from his earlier years as a rather sickly child, Roosevelt was also quite famous for his array of daring pastimes, such as boxing, hiking, hunting, and others, and also was in the military leading his own cavalry unit that was instrumental from driving the Spanish from Cuba, and this all helped to mold his image as the ultimate tough guy. Considering his adventurous lifestyle and outdoor excursions, it is perhaps no surprise that the popular Roosevelt has over the years accumulated about himself a rather larger than life image, with numerous rumors and legends associated with him, and yes some have to do with none other than the North American mysterious creature called Bigfoot.